Home > News > Do you know how to save a life? Recently the former England manager and Tottenham Hotspur midfielder Glen Hoddle suffered a heart attack while appearing on BT Sports on his 61st birthday. Fortunately, a BT Sports member of staff knew exactly what to do. The aim of First Aid is to “Preserve Life” and due to prior first aid training which “kicked in”, the staff member was able to first check for breathing and circulation before starting emergency first aid treatment consisting of CPR. He also used a defibrillator which was situated on the premises and was able to keep the former manager alive until paramedics arrived and took over treatment before being transferred to a hospital. Sudden cardiac arrest (SCA) is one of the leading causes of death in the UK, with approximately 30,000 out-of-hospital cardiac arrests happening each year. Without immediate treatment, 90-95% of SCA victims will die, and for each minute that passes where a victim doesn’t receive treatment, their chance of survival decreases by approx. 10%. A cardiac arrest can affect anyone at any time – from young children at school, to adults when they’re at home, work or out in public places. Without immediate intervention, cardiac arrests are usually fatal. For an individual to have any chance of survival, the first person on the scene must know what to do, be confident enough to do it and act quickly. The chance of surviving a cardiac arrest jumps from a mere 5% to an incredible 74% if the casualty is in a ‘shockable’ rhythm and a defibrillator is deployed within 3 minutes. A person that has had a cardiac arrest is actually clinically dead, so you cannot harm the casualty – all you can do is help them. Defibrillators are really important because they can save someone’s life and they are really easy to use as they tell you exactly what to do. How do you know if someone is in Cardiac Arrest? If a person is unresponsive and not breathing, they are in cardiac arrest. This means their heart has stopped pumping blood around their body. If an automated external defibrillator (AED) is used within three to five minutes of them collapsing, it can produce survival rates as high as approx.70 per cent. There is no denying the life-saving power of an AED – but behind it is the life-saving power of people. You only have a short period of time to act when somebody suffers a sudden cardiac arrest. The good news is public awareness of defibrillators is growing in the UK. A lot of the High Street supermarkets such as Morrison’s have installed defibrillators and supported training for their employees. They can also be found in tube stations, bus depots, train stations, dental surgeries, theme parks and sports complexes. Villages often have them installed in old phone boxes or on the wall of the village hall and they are thankfully now far more accessible. So, what is a Defibrillator? 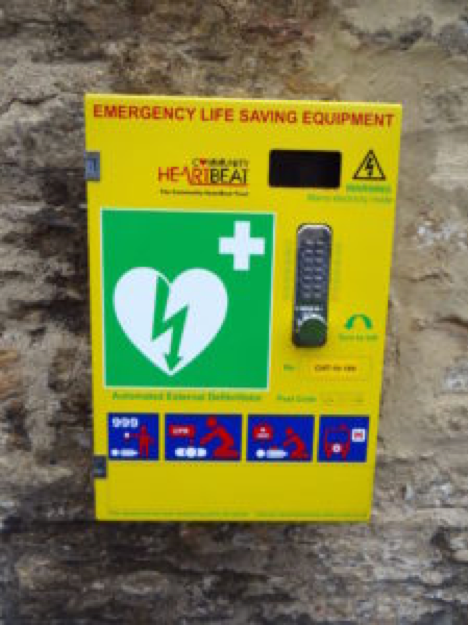 A defibrillator or AED is an automatic device, simple enough to be used by the public, which shocks the heart back into its normal rhythm during cardiac arrest. An AED is a machine that can shock the heart of a person who is unresponsive and not breathing, back into a normal rhythm. Defibrillators can be the difference between life and death. It is vital you know how to recognise and use one. Next time you’re out in your local area why don’t you keep a look out for an AED. They typically have signs up on the walls with the AED unit embedded in a small unit and are usually painted bright yellow or similar. Knowing where they are could make it easier to find them if you are ever in a situation where one is needed and potentially save a life. As part of First Aid courses you can learn how to treat a casualty having a cardiac arrest and how to use a defibrillator. Why not look at our events page to see the first aid courses available in your area.